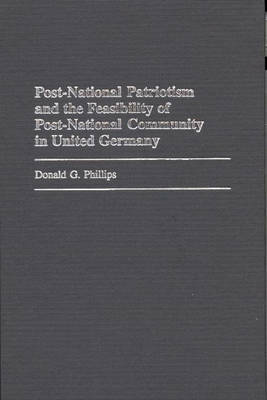 With a focus on united Germany and the post-1989 German unification process, Phillips outlines the necessity and feasibility of a concept of post-national patriotism. Specifying the example of racist violence, Dr. Phillips argues that a substantial measure of Germany's social consensus can only be extended to heterogeneous Europe if there is a greater recognition of heterogeneous Germany, not only by Germans, but by non-Germans as well. He shows that the consensual structures of German-based transnational business may play a leading role in the development of a sense of post-national patriotism. Phillips argues that state solutions to issues of immigration and integration are not in themselves adequate, and that these may be supplemented by private-sector institutions taking on responsibility. Business opposition to racist violence in unified Germany has neither succeeded substantially in eliminating racism in Germany, nor achieved a significant reduction in non-Germans' prejudices about Germans. However, he argues that an accentuation of German business practices of codetermination worldwide could go a long way to changing prejudices about Germans and prejudices in Germany, as well as serving the interests of German-based business. Greater processes of dialogue, also involving the private sector, could help correct problems of group definition and intercultural understanding, promoting shared civic identification instead of civic demarcation. This is an important analysis for scholars and researchers involved with the society and politics of Germany, international relations and business, and European integration.